Eyþór Laxdal Arnalds, chairman of the district council for the Independence Party writes an article in today's Morgumblaðið sayiing that the longstanding protest by asylum seekres in Austurvöllur has left the grass muddy and that the area is messy. The asylum seekers have now left the area. Asylum seekers pitched up a tent at Austurvöllur and have permission from the City of Reykjavik to have one there until 8 pm daiæy but at that hour they are supposed to remove it. Until last night, this was not done and Arnalds criticises city authorities for creating a bad example. 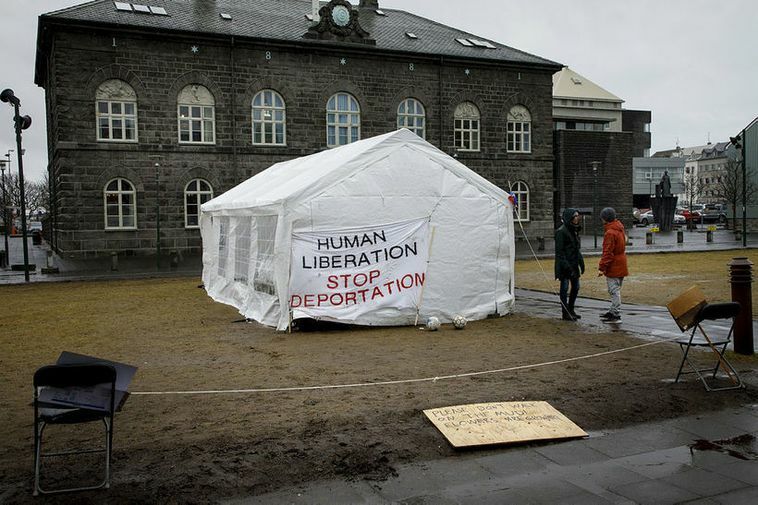 The issue has divided Icelanders into those who support the demands by asylum seekers for better conditions at the Ásbrú refugee camp and those who are annoyed and want to send the asylum seekers " back home". No Borders write on their Facebook page that Ásbrú is an isolated area where 100 asylum seekers and refugees reside, security guards patrol the area and no visits are allowed. If people want to visit Reykjavik it costs them 4000 ISK. They say that keeping asylum seekers at the 'Asbrú camp makes them even more isolated and completely invisible to the general public.